NEW DELHI: Moving swiftly after NDTV highlighted chaotic scenes at Delhi airport's immigration counters, the government has decided on a massive upgrade of immigration services. It will open, within three months, 20 additional immigration counters in the airport's departure area and 35 more for foreign visitors landing in the country on an e-Visa. The plan was earlier caught up in turf wars of the home and civil aviation ministry, the two arms of the government responsible for security and upkeep of the airport who blamed each other for the mess. The decision to open 55 counters is the single largest expansion of immigration facilities at the Delhi airport that had 75 counters each for arriving and departing passengers. The first set of 10 new counters at the airport's departure side should be functional by 20 November, Union Home Secretary Rajiv Gauba ordered at a high-level meeting convened after the NDTV report. 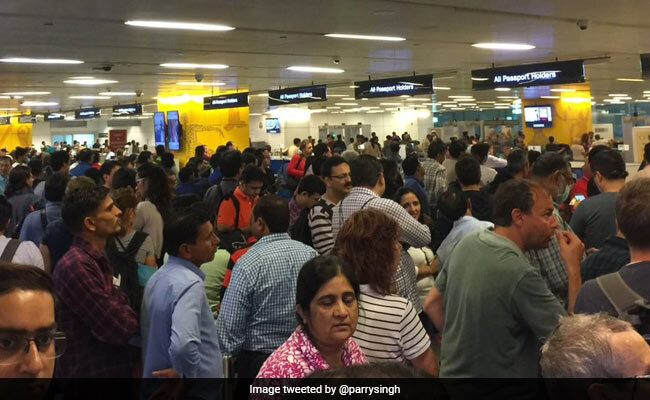 The Delhi International Airport Limited, the joint venture firm that runs the national capital's international airport, has also been told to find space for 10 more counters in the departure area. These, Mr Gauba decided, had to be functional by January 2018. For foreign tourists arriving on an electronic visa, 10 dedicated e-Visa counters would be opened by 30 November, and 25 more by January 2018. "This will facilitate foreigners availing electronic Visa which is becoming increasingly popular," an official statement issued on Thursday said, adding the meeting was called after media reports about long queues during peak hours. Bureau of Immigration will provide 1,800 personnel to improve immigration services by filling up vacant posts, inducting personnel from central police forces and even taken in ex-servicemen. NTDV had on Wednesday reported on the endless queues at immigration counters that had continued because the bureaucracy was working at cross purpose, too busy fighting its turf wars. The government had taken serious note of the situation, and told Home Secretary Rajiv Gauba to take charge. Mr Gauba dispatched a team of senior officers to the airport to make an assessment and later got the airport authority and immigration officials to come up with solutions. But before they started discussing the problems at the airport, a senior official said, the Home Secretary gave the top officers a dressing down and told them to work as a team, not against each other. The meeting also discussed various measures including technology upgradation, provision of modern equipment, professional manpower etc. for improving immigration services at Delhi Airport.